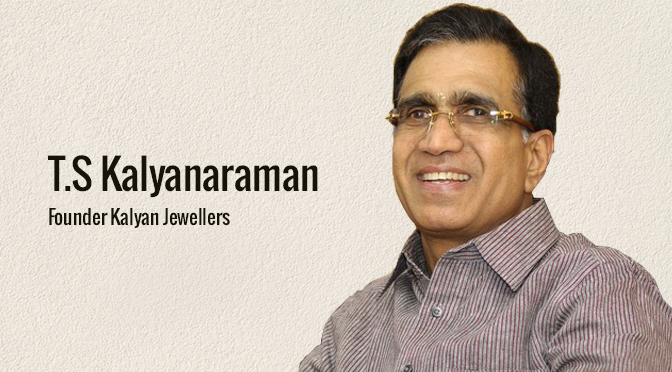 T. S. Kalyanaraman is the chairman of Kalyan Group along with Founder Chairman & Managing Director of Kalyan Jewellers. Kalyan Group is the holding company of Kalyan Jewellers. According to the latest report of Forbes; his net worth is valued at roughly USD 1.1 billion and is ranked #87th richest person in India. T. S. Kalyanaraman son of Seetharamaiyer was born in 1951 in the Thrissur City in Kerala and completed his education in the field of commerce from Sree Kerala Varma College. Married to Ramadevi who is a house wife; his immediate family consists of three children & 5 grandchildren i.e. two sons, one daughter, two grandsons and three granddaughters. His eldest son Rajesh Kalyanaraman who is married to Maya Rajesh takes care of the inventory and finance departments whereas Ramesh Kalyanaraman who is married to Deepa Ramesh leads the marketing and operations departments. His daughter Radhika is a house wife and his son-in-law, Karthik R is the Managing Director of ‘Kalyan Developers’, their latest venture. As a family; their grandfather, T. S. Kalyanaramaiyer was the first person to take the initiative of moving from priesthood to become a businessman. Coming from such a family who has been in the field of business for the past 110 years has helped him gain immense and core understanding of the functionalities and ideologies of business. He began his entrepreneurial journey at an early of 12! Being the eldest son, after the lessons and games were completed Kalyanaraman’s father used to regularly take him to their textile shop to watch and understand the business. He would also delegate him petite tasks which he would enjoy doing, such as counting cash or taking stock; to teach him the functioning and also to get him acquainted to the environment. Their father often used to tell them that the customer is the king and without them we are nobody, thus teaching them how to behave with the customers. All the children of Seetharamaiyer grew up carefully listening & instilling even the smallest piece of his advices. He used to say, “Lesser margin and more turnovers would give more profit.” His farsightedness was so much that, what corporates now preach and follow was taught to them in those days. This helped him learn the basics at a very early age, eventually making him the master of the game, at large. Kalyan group collectively has holdings in three companies i.e. Kalyan Silks (Kalyan Silks, Kalyan Sarees and Kalyan Collections), Kalyan Jewellers and most recently Kalyan Developers. The group was started in the year 1909 by T. S. Kalyanaramaiyer, a priest and got its name from its founder himself. Presently, its headquarters is located in Thrissur city of Kerala. It initially started-off as a textile mill which was later taken by Government of Kerala, after which he moved to Kumbakonam in Tamil Nadu and started a textile shop in Thrissur city. Later his son Seetharamaiyer joined the business and once their sons were ready, partitioned the businesses to five sons in 1991. The key people in the group are T. S. Kalyanaraman who chairs & manages Kalyan Jewellers and T. S. Pattabhiraman who chairs & manages Kalyan Silks. Recently, the group has also diversified into the real estate development industry in the name of Kalyan Developers and also may soon step into the field of 7-star schooling with future plans of entering the entertainment sector through a chain of multiplexes as well. The textile shop started by T. S. Kalyanaramaiyer flourished on to become a leading worldwide brand in the form of Kalyan Silks, Kalyan Sarees and Kalyan Collections. Kalyan Silks, the world’s largest silk saree showroom network continues to be the most trusted brand in Kerala for more than a century now. As of date, Kalyan Silks, domestically has presence in Kochi, Thrissur, Palakkad, Kozhikode, Kannur and Kottayam, Thiruvalla, Bangalore along with world-class showrooms present internationally in Dubai and Sharjah. With aims to make a presence worldwide; in the near future the brand will be expanding to locations like Thiruvananthapuram, Sri Lanka, Malaysia and Singapore as well. With 7500 employees, Kalyan Jewellers is the largest Jewellery chain in India. Being a part of the group, it also is headquartered in Thrissur city of Kerala. Kalyan Group is the holding company of Kalyan Jewellers but is chaired and managed by T. S. Kalyanaraman. Kalyan Jewellers was started in the year 1993 with an investment of INR 7.5 million (INR 75 lakhs) in Thrissur itself. After the recent fund raiser from Warburg; Kalyan Jewellers is currently being valued at about $ 2 billion. With a massive advertising and marketing budget of around INR 900 million ($14 million); Kalyan Jewellers is one of the few brands in the industry which holds some of the most reputed names as their brand ambassadors such as Amitabh Bachchan, Manju Warrier, Aishwarya Rai Bachchan, Nagarjuna Akkineni, Prabhu Ganesan and Shivaraj Kumar. And according to media reports, Aishwarya Rai Bachchan alone charges INR 10 crores ($1.6 million) per year for a two year deal with Kalyan. They were the pioneers to sell only BIS (Bureau of Indian Standards) hallmarked Jewellery, to dissect cheating and malpractice in gold quality and pricing. And have also installed state-of-the-art carat meters to test the purity. Later, Kalyan Jewellers decided to reward their loyal customers by introducing a loyalty programme– the Kalyan Gold Card. This was for the customers which were not limited to just schemes and gifts offered seasonally. Next, Kalyan Jewellers was the first retail company to put rate tags on its products and selling Jewellery at fixed real prices. To add to that; they went to the extent of publishing the average price of basic categories of ornaments to prove their affordability and legitimacy. After that, Kalyan Jewellers opened 101 customer service centres called ‘My Kalyan’ throughout Kerala to provide services like Jewellery purchase advance schemes, gold insurance, wedding purchase planning, advance booking of purchases to protect against price increase, sales of gift vouchers, gold buying tips, education, etc. Gradually they will also be expanding nationwide. Lastly, Kalyan Developers is the latest venture of Kalyan Group and has entered the industry with an aim to make it transparent and to remove the stains of delays, disappointment and distrust. Although there is not much to talk about it as of now but the first residential project of Kalyan Developers which has recently been completed is at Thrissur called Kalyan Helioce. Other than that; they also have upcoming and ongoing projects in other cities such as Calicut, Trivandrum, Kochi, Coimbatore, Chennai and Bangalore. The services they offer include Kalyan Properties, Kalyan Interior & Kalyan Assist. The Kalyanaraman family, belong to migrants from Tanjavur district of Tamil Nadu who are successors of individuals who came from a religious backgrounds that comprised of priests, saints and advisors to kings. With a belief that business was necessary to create job opportunities and to make India self dependent; the decision to start a business was taken by a Dewan to the Maharaja of Kochi, who was one of the senior relatives of the family. Following their ideologies and principles of fair business practices with a social objective and not just for selfish motives, Kalyan Group was initiated in the year 1909 by T. S. Kalyanaramaiyer which is now succeeded by his grandson T. S. Kalyanaraman. After completing his B.Com, in 1972 Kalyanaraman for the first time was asked to take charge of Kalyan Textiles, which then had a stock capacity of around INR 15 lakhs and a turnover of around INR 25 lakhs. He used simple strategies like increasing the stocks to satisfy every customer of theirs and appointing more people so that every customer got individual attention. He also instructed his staff to behave cordially with all customers; thus making sure they have a pleasant experience. Using his mind and strategies; in the first year itself, he pumped up the turnover to INR 30 lakhs. Under this organized model set by Kalyanaraman, from here onwards; every year their turnover began increasing by multiple folds. Most of the profit they earned, they invested it on buying new stock. By 1991, their turnover began touching INR 1.5 crores. This is when Seetharamaiyer, their father decided to partition the businesses among the five sons for unknown reasons. Now during that time; their customers often asked them to start a Jewellery shop, so that they could buy saris and Jewellery from the same place. Motivated & inspired by their customer’s needs, in 1993 Kalyanaraman decided to start his own Jewellery shop by the name of Kalyan Jewellers. The total investment he made was INR 75 lakhs out of which INR 50 lakhs came from his own pocket and the rest INR 25 lakhs was loaned from a bank. Going against the trend he opened a rather huge store with an area of 4000 sq. ft which was fully air-conditioned with ample sitting capacity, clean toilets and enough space for car parking; similar to that was seen in abroad. Thus, making them the largest Jewellery showroom in South India! They offered all kinds of models and designs in customized formats, which the buyer could collect in roughly a month’s time. Within the first year itself, they made a turnover of around INR 50-60 crores. Soon, buyers from the nearby towns like Palakkad, Kozhikode, Kochi, etc. also started coming to their showroom. Looking at this huge response; they also introduced silver, diamonds and traditional Jewellery as well. In the midst of 1995 to 2000; both his sons Rajesh Kalyanaraman & Ramesh Kalyanaraman joined the business, fulltime. This came as a blessing-in-disguise for him! He quickly made his eldest son the in-charge of purchasing & finance and the youngest son the in-charge of sales and marketing, while he did the overall supervision. With their help; Kalyanaraman was successfully able to organize, modernize & expand the business massively. And within just 12 years or by March 2012, they increased to 31 showrooms in total; with 8 being in Kerala, 14 in Tamil Nadu, 4 in Karnataka, 4 in Andhra Pradesh and 1 in Pondicherry. To top that, they now had about 4000 employees. With 31 showrooms functioning live and 19 more on its way; it took a lot of time to travel from one to another to check quality, supervise the purchase and also go through the designs and meet the customers. Hence, they decided to buy a INR 30 crore, seven-seater Phenom 100 executive Embraer jet which was followed by a fleet of Embraer Phenom’s and a Bell 427 chopper’s along with their latest purchase of a new 13-seater customized Embraer Legacy 650 aircraft. Other than that; in October 2014 it was disclosed that Warburg Pincus, American private equity firm had picked up a minority stake in Kalyan Jewellers. The firm invested about INR 1,200 crores in Kalyan Jewellers which got them a stake of around 10 to 12%. After the investment; Kalyan Jewellers is being valued at roughly $ 2 Billion (INR 13,000 crores). They plan to use the investment to add 28 showrooms, including 12 overseas in countries like the UAE, Kuwait, Singapore and Malaysia, to its existing 61 stores. And presently; Kalyan Jewellers is expected to close the year 2014-15 with revenues of INR 10,000 crores and in the next three years the company is looking to pump up their revenues to INR 25,000 crores. Under the leadership of T. S. Kalyanaraman; Kalyan Group has become one of the very few ‘family businesses’ which has managed to change their strategies with the course of time and has successfully adopted the much required corporate structure, to be able to cross the barriers of “limitations”. And as a whole certain key points such as setting up own manufacturing facilities to ensure quality control and to offer unique designs, treating employees like family & paying above-market wages and most importantly having direct customer interaction to as much extent as possible – which Kalyanaraman has been following religiously; have brought about a huge difference in cutting the competition and succeeding as well! TRIVIA: – Narayan Gowda, who works with the Karnataka Public Works Department had purchased a pair of bangles and to his surprise, a week later he had received a call from T. S. Kalyanaraman himself, enquiring about his entire buying experience. These degrees of attention to detail are the reasons why Kalyan Group has tasted big success.